There are people who feel they are out of place in our century, as if they were born in another time. Fritz Kirsch is one of those persons in the guise of a middle-school language arts teacher. But in reality he is a nineteenth-century photographer following the Civil War encampments in his horse-drawn darkroom and photographic wagon photographing the soldiers when and where a living can be made. Kirsch's new exhibit encompasses a wide ranging sample of his work, including images of historic value like the only view of a complete Federal artillery battery with six full cannons pulled by horses. Kirsch was the only period photographer allowed to photograph it. As he says, "It may not be the prettiest of all the images, but it is very special by its uniqueness. Another one is the picture of the 54th Massachusetts. It is the only period image of the revitalized unit in as large a contingent as they have appeared, being extras for the movie Glory ." All photographs in the gallery are available for purchase. 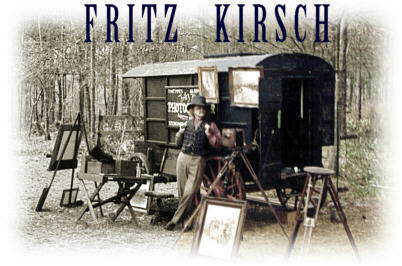 Enter the world of Fritz Kirsch and enjoy! 19 Jan 2000 Mountain Man Rendezvous, Alafia, Fla.
19 Jan 2000 Brookesville Raid Reenactment Brookesville, Fla.
03 Jul 1998 Mountain Man Rendezvous, Fla.